Assume you are trading 6E (EUR/USD) on a 3/5 min timeframe. Current price is halfway between support and resistance on a 30min timeframe. The trend is up and your premise is for price action to continue upwards for a test of resistance. Price action now goes into a pullback showing short term bearish bias. What decisions do you make about taking a counter trend trade with the short-term bias but against the trend and your premise? I assume one decision would be aggressively monitoring the trade but would it be worth it? I also assume that your trading experience also guides you to expect, say, a 50% retracement? Maybe the uptrend has been slow/fast and you believe there is now an imbalance between buyers and sellers? Good/bad daily news? First, it’s important to recognise that if your premise is for the trend to continue to S/R then any counter-trend trades will be a much lower probability. It’s much better to stick to the with-trend opportunity. If I understand your scenario correctly, you’re just talking about trading the pullback. You’re not expecting a reversal. So… stick to with-trend. I prefer to not rule out counter-trend opportunity entirely, but will say that I largely agree with Al Brooks’ statement. The best opportunity is with-trend. 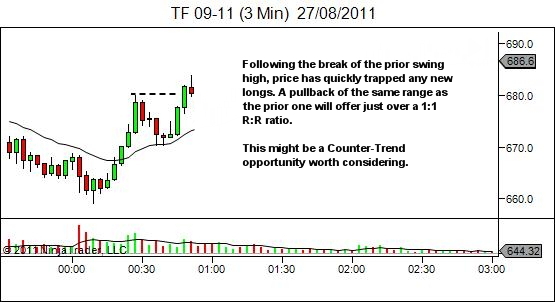 Counter-trend is MUCH harder and you should think VERY carefully before considering counter-trend trades. Ok… so let’s assume you do want to take counter-trend trades. The first thing we need is the right environment, so we need to consider the nature of the trend. 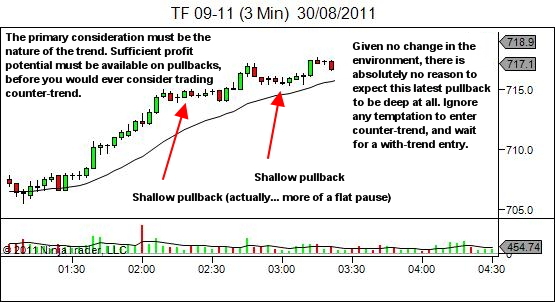 In particular, we’re concerned with the depth of the pullbacks, as they must be deep enough to allow for profit potential. I don’t necessarily assume a 50% retracement, but instead expect pullbacks to remain consistent with previous pullbacks within that trend (until something changes). So if the trend is fast and previous pullbacks are shallow, then attempting counter-trend entries would be just pointless – financial suicide. There will not be sufficient counter-trend price movement to allow for profit. Stand aside, and watch for with-trend entries back in the direction of your bias. However if the trend is slow and wide swinging, then there may be sufficient profit potential. 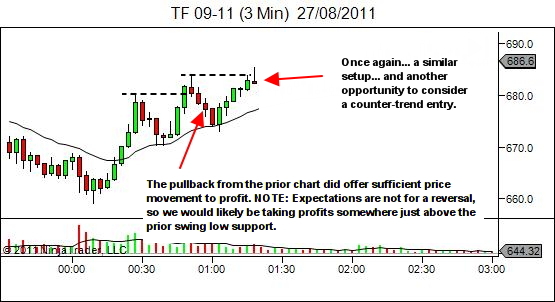 There is only one thing – and it’s the same with all setups (with-trend and counter-trend). I have to believe that this entry is at a source of orderflow that can move price in my favour. There is never any other reason. So if the market is rallying and I want to take a short counter-trend trade, it will only be because current price location and behaviour make this an obvious location for other people to go short with or after me. Perhaps current price action will tempt existing longs to take profit, or at least lighten their position. Perhaps late longs will want to scratch or take their loss due to expectation of a fall. Perhaps something will attract new shorts (eg. maybe it’s an obvious point on higher timeframes for a pullback short entry). The way I prefer to trade is to identify trapped traders. So I’ll be looking for something that brings in new late longs and then reverses, raising sufficient fear in their minds to cause them to exit. 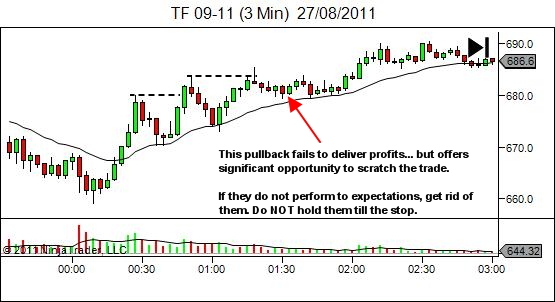 I suspect you’re really after a pattern or price action answer – eg. over-extended price movement, then a retest which breaks and fails. To be honest, this would be one case when it may be a great short (given deep enough pullbacks). However, there may be other short opportunities that look equally as good, without meeting this pattern definition. I’m not a simple pattern based trader. I trade against other market participants. So, the answer must take them (and their decision making) into account. So, what influences my decision to enter counter-trend. Trapped longs wanting to get out. A quick word about trade management – it must be aggressive. I do not trust these positions at all. If they do not move in the required direction in accordance with my expectations, then they should be scratched. You can always re-enter if subsequent assessment says it’s still a good trade. But don’t blindly hold till either your target or stop. Counter-trend opportunity, not at S/R, are a lower probability trade.